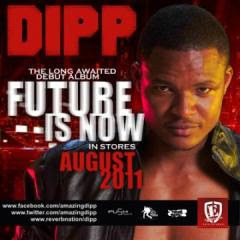 Nigerian Pop singer, DIPP is finally set to release his much anticipated debut album FUTURE IS NOW in August, 2011. The album which he has been working on since 2006 will be released on Effyzzie Records. The album contains 16 tracks [3 bonus cuts inclusive] and features artistes such as Waje, Da Grin,M.I, Yemi Alade, YQ, Mode 9, Maytronomy, Beazy, Ill Bliss, Kel, Blaise, Muna, Gino and others. Current mainstream sensation Wizkid and upcoming artiste Lady Aku also contributed to thealbum. Producers on the album include Sossick, Kraft, E Kelly and TK. Future Is Now features hitt racks like Dangerous, Pop Off Selecta, Good Girls andWhich Is The Way. Other hot tracks include I Do, Jeje Remix, and Follow Me Go among several others. “Finally the album has arrived. I would like to thank all my fans for being patient with me fo r so long. There were moments for me when the journey was tough but their love and words ofencouragement kept me going. Future Is Now is a labour of love that I dedicate to my fans which are known as Team Amazing and basically lovers as well as supporters of good music” says DIPP.“This album will stand the test of time. 5 years down the road, 10 years down the road, Future Is Now will still be regarded as a phenomenal album. I want to make a statement that good music can sell in this country and my album is my statement” further adds DIPP. DIPP who is the flagship artiste on Effyzzie Records shot into limelight in 2008 when he released his genre-bending hit song Dangerous featuring M.I. Due to the innovative special-effects and groundbreaking dance sequences in the video Dangerous won the Best Special Effects and Editing award at the Sound City Music Awards in 2009. In 2010 DIPP upped the ante by releasing the high octane dance track Pop off Selecta. The video within the space of 8 weeks peaked at the number one spoton major video charts nationwide.Pop Off Selecta grabbed two awards at the NMVA 2010- Best Use of Special Effects and Best Choreography.This month DIPP released the video to his third major single Kosorombe featuring Da Grin. The video which was directed by DIPP’s long time collaborator MEX has been adjudged DIPP’s best video by industry taste makers and is gradually easing its way up the charts; both radio and TV.The pop singer is getting set to shoot his fourth major video Good Girls Remix featuring YQ, Blaise, Kel and Muna. After dropping his album, DIPP will embark on a club tour nationwide which will end with a climatic grand concert at Eko Hotel in November. Also DIPP is getting ready to star in a dance movie in 2012. The script of the yet untitled dance movie is in the development stage and is a collaborative movie production between Major Boy’s Premonition Pictures and Aliyu Taiye’sEffyzzie Entertainment.